Carbapenem resistance in Acinetobacter baumannii in China was mainly mediated by OXA-23-like carbapenemases, while OXA-24/40-like carbapenemases were rarely identified. OXA-72 is one variant of OXA-24/40-like carbapenemases. This study aimed to demonstrate the epidemiology and characterizations of OXA-72-producing A. baumannii in a Chinese hospital. A total of 107 clinical A. calcoaceticus-A. baumannii (Acb) complex isolates were collected in a Chinese hospital during between 2014 and 2016. These isolates were identified using Vitek 2 system and gyrB multiplex PCR. Vitek 2 system was used for antibiotic susceptibility testing. Genes encoding for major classes of carbapenemases were investigated by PCR. Rep-PCR was used for genotyping of all the A. baumannii isolates. The risk factors for carriage of OXA-72-producing or OXA-23-producing A. baumannii were analyzed through univariate and multivariate logistic regression. Of the 107 Acb isolates collected, 101 isolates (94.4%) and 6 isolates (5.6%) were identified as A. baumannii and A. pittii, respectively. 78 A. baumannii isolates (77.2%) were carbapenem resistant and mainly cultured from intensive care unit (ICU). blaOXA-72 and blaOXA-23 genes were identified in 45(57.7%) and 33(42.3%) carbapenem-resistant A. baumannii (CRAB), respectively. Multivariate risk factor analyses showed that prior carbapenem usage and nasogastric intubation were significantly associated with carriage of OXA-72-producing A. baumannii or OXA-23-producing A. baumannii. Rep-PCR analysis showed that 9 and 22 Rep-PCR types were assigned to 78 CRAB isolates and 23 carbapenem-susceptible A. baumannii (CSAB) isolates, respectively. A higher diverstiy of Rep-PCR patterns was observed among OXA-72-producing A. baumannii isolates than OXA-23-producing A. baumannii isolates, but all of them belonged to the same clone complex. MLST analysis suggested that the OXA-72 isolates from this study correspond to CC92/CC2 clone complex. This study demonstrates high prevalence and potential clonal spread of closely related genotypes of OXA-72-producing A. baumannii within a Chinese hospital. Continuous surveillance is necessary to monitor the dissemination of these strains in other healthcare settings to guide infection control policies in order to curb the spread of this bacterium. Acinetobacter is a gram-negative coccobacillus that has rapidly emerged as one of the most common nosocomial pathogens worldwide . There are currently at least 31 described Acinetobacter genomic species , of which A. calcoaceticus, A. baumannii, A. pittii, and A. nosocomialis are very closely related, and difficult to distinguish from each other by phenotypic properties . A. calcoaceticus-A. baumannii (Acb) complex has therefore been proposed to refer to these species . Nevertheless, A. baumannii is the most clinically relevant and is notorious for its ability to accumulate diverse mechanisms of resistance [4, 5]. The carbapenem class of antibiotics is considered as the last-resort choice when treating Acinetobacter infections. 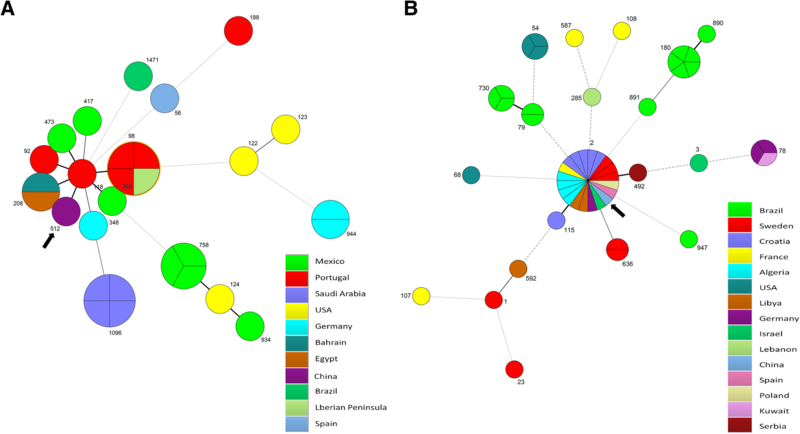 However, an increasing prevalence of carbapenem resistance has been observed in clinical A. baumannii isolates from many parts of the world. Carbapenem-associated multiclass resistance among 55,330 U.S. A. baumannii isolates from The Surveillance Network database has increased from 20.6% in 2002 to 49.2% in 2008 . In China, the resistance rate of clinical A. baumannii to carbapenem gradually increased from < 10% in 2000 to > 60% at present [7, 8]. The major mechanism of carbapenem resistance is production of OXA β-lactamases, which are clustered in three major groups, OXA-23-like, OXA-24/40-like, and OXA-58-like [9–11]. OXA-24/40 β-lactamase was first identified in A. baumannii from Spain in 1997 . After that, A further 6 enzyme variants have since been discovered, including OXA-72 . Unlike OXA-23-like, OXA-24/40 β-lactamases were less commonly identified in carbapenem resistant Acinetobacter spp. isolates . A large surveillance of OXA-type β-lactamase gene clusters for a total of 2880 Acinetobacter spp. isolates collected from 23 Chinese provinces found that blaOXA-23-like and blaOXA-24/40-like genes were identified in 1316 isolates (45.7%) and 11 isolates (0.4%), respectively . Therefore, OXA-24/40-like β-lactamases were only responsible for a small number of carbapenem-resistance isolates in China, their dissemination and epidemiology in healthcare settings deserves further surveillance and investigation. This study aimed to demonstrate the occurrence, clinical manifestation and genotypic characterizations of OXA-72-producing A. baumannii in a Chinese hospital. A total of 107 clinical Acb complex isolates from 107 patients were collected at a tertiary-care comprehensive hospital in northeastern China with 1800 beds, from Oct 2014 to Oct 2016. These isolates were recovered from various specimens including sputum, blood, urine, pleural fluid, secretions and throat swab sample. For each patient, only a single colony of the first isolate was selected for subsequent analysis. All the clinical isolates were stored at − 80 °C until use. Data for each isolate and each patient were obtained through review of microbiology lab results and medical records. Risk factor data, including ICU stay, presence of invasive procedures and antibiotic treatment, referred to those which were present before the isolation of the index Acinetobacter strains. All data were anonymously collected and interpreted. Identification of Acb complex isolates was initially performed using automated identification systems the VITEK 2 compact system (BioMérieux, Craponne, France). Further identification of the Acb complex to the species level was performed by gyrB multiplex PCR [15, 16]. In vitro susceptibilities to ampicillin-sulbactam, piperacillin-tazobactam, ceftazidime, cefepime, meropenem, imipenem, gentamicin, amikacin, ciprofloxacin, levofloxacin, colistin, minocyline were determined by the VITEK 2 compact system (BioMérieux, Craponne, France). Escherichia coli (ATCC 25922) and Pseudomonas aeruginosa (ATCC 27853) were used as quality control strains. Results were interpreted according to the Clinical and Laboratory Standards Institute (CLSI, 2016) guidelines. One white loop (1 μl) of 24 h plate culture of Acinetobacter bacteria was resuspended in 200 μl of sterilized and DNA free water. The bacterial suspensions were then heated for 10 min at 96 °C and centrifuged 5 min at 13000 rpm. The supernatant was used as the genomic DNA for the following molecular experiments. Genes encoding for major classes of A, B, and D carbapenemases for all the Acb isolates were investigated by PCR. The presence of blaOXA-23-like, blaOXA-24-like, blaOXA-51-like, and blaOXA-58-like genes were detected through multiplex PCR assay . Metallo-β-lactamase encoding genes, blaNDM-like, blaIMP-like and blaVIP-like, were detected with PCR conditions and primers as previously described . The blaOXA-24-like variant was further identified through PCR and DNA sequencing as described . Rep-PCR was used for genotyping of all the A. baumannii isolates, using the primer pair REP 1(5’-IIIGCGCCGICAGGC-3′) and REP 2(5’-ACGTCTTATCAGGCCTAC-3′) . The conditions for PCR and the gel electrophoresis were the same as previously described . Rep-PCR results of each isolate was compared to all of the other isolates in a pairwise manner, isolates with identical band patterns were considered to be of identical Rep-PCR types. A minimum spanning tree was created to show the differences between patterns through BioNumerics 6.6 software (Applied Maths, Kortrijk, Belgium). The spanning tree was limited to those patterns that differ by a single band, two Rep-PCR types that differ by two or more bands were connected. Nine blaOXA-24-like gene positive representative isolates from each different Rep-PCR type were randomly chosen for multilocus sequence typing (MLST) analysis according to ‘Pasteur’ scheme . Currently, there were two MLST schemes available for Acinetobacter. In order to differentiate between the two schemes, STs and CCs were designated as STB/CCB for the Bartual scheme and STP/CCP for the Pasteur scheme. A search of previous published papers giving the MLST results of OXA-24/40-like producing Acinetobacter spp. was conducted to illustrate the population structure of OXA-24/40 strains from different countries. The MLST data from ‘Pasteur’ scheme and ‘Bartual’ scheme were separately analyzed by Bionumerics 6.6 and presented as a minimum spanning tree for categorical data with default settings. Statistical analyses were performed using SPSS 19.0 (IBM, Armonk, NY, USA). The comparisons of patients’ characterics were conducted by chi-square test or Mann-Whitney U test. The risk factors for carriage of blaOXA-72-positive or blaOXA-23-like-positive A. baumannii were analyzed through univariate and multivariate logistic regression. In multivariate logistic regression, ICU stay and length of ICU stay were not included as they were highly associated with many other predisposing factors, including invasive procedures and antibiotic use. The index of diversity and the 95% confidence intervals (CIs) were calculated as described previously . P values < 0.05 are considered statistically significant. Of the 107 Acinetobacter isolates, 101 isolates (94.4%) and 6 isolates (5.6%) were identified as A. baumannii and A. pittii, respectively. Five A. pittii isolates were susceptible to all the antibiotics tested and one isolate exhibited an intermediate resistance phenotype to minocycline. Among the 101 A. baumannii isolates, 78 isolates (77.2%) were resistant to carbapenems (meropenem or imipenem). The rates of resistance to piperacilin/tazobactam, ampicillin/sulbactam, amikacin, gentamicin, ceftazidime, ciprofloxacin and levofloxacin in A. baumannii were all above 60%, as most of the carbapenem-resistance isolates exhibited a multidrug resistance phenotype. Four A. baumannii isolates were resistant to polymyxin. The 107 Acinetobacter isolates were cultured from 71 male and 46 female patients. Fifty-one isolates were cultured from patients in ICU and all these isolates were carbapenem-resistant. The detection of carbapenemase genes showed that 33 (42.3%) of the 78 carbapenem-resistant A. baumannii (CRAB) were positive for the blaOXA-23-like gene, while the other 45 isolates (57.7%) were positive for the blaOXA-24/40-like gene. All these isolates harboured blaOXA-51-like gene. DNA sequencing showed that all the blaOXA-24/40-like amplicons belonged to blaOXA-72 (GenBank accession number MF781069). The blaOXA-58-like gene was detected in one carbapenem-susceptible A. baumannii (CSAB) isolate, the MICs for imipenem and meropenem were 0.5 μg/ml and 0.25 μg/ml, respectively. None of these Acinetobacter isolates were positive for blaIMP-like, blaVIM-like or blaNDM-like genes. Eighty-four (83.2%) of 101 A. baumannii isolates were associated with an infection (primarily low respiratory tract infection) and antibiotic treatment, while the other 27 isolates were just colonized. The characterics of 101 patients colonized or infected with A. baumannii were shown in Table 1. There were no significant differences over age and gender distribution among patients colonized or infected with CRAB and CSAB strains. More than 60% of the CRAB patients stayed at ICU at the time of bacteria isolation, while only one CSAB patient stayed at ICU. The results of univariate logistic analysis showed that there were many common risk factors for carriage of OXA-72-producing A. baumannii or OXA-23-producing A. baumannii, such as ICU stay, mechanical ventilation, nasogastric intubation and carbapenem treatment (Table 2). In multivarite analysis, prior carbapenem usage and nasogastric intubation were significantly associated with carriage of OXA-72-producing A. baumannii or OXA-23-producing A. baumannii. An additional risk factor, urinary catheter, was also significantly associated with carriage of blaOXA-23-like-positive A. baumannii (Table 3). The results of Rep-PCR patterns and corresponding strain information for the 101 A. baumannii were shown in Table 4. In total, 9 Rep-PCR types were assigned to 78 CRAB isolates, while 22 Rep-PCR types were assigned to 23 CSAB isolates. The index of diversity (DI) for CRAB was 0.750 (95% CI: 0.671–0.829), which was significantly lower than for CSAB (DI = 0.996, 95% CI: 0.986–1.006). Twenty-six and 7 OXA-23-producing A. baumannii isolates were identified as Rep-PCR type 1 and 2, respectively, while 45 OXA-72-producing A. baumannii isolates were distributed in the 9 Rep-PCR types. Minimum spanning tree analysis of Rep-PCR patterns showed that all the 78 CRAB isolates were clustered into one clone complex, while most of the CSAB isolates were not connected to each other (Fig. 1). MLST analysis showed that all the 9 representative OXA-72 isolates in this study belong to ST2 (Table 4). A literature review of previous published MLST data showed that there were at least 19 ST types (Bartual scheme) for 29 OXA-24/40-like producing Acinetobacter spp. isolates from 11 countries and 21 ST types (Pasteur scheme) for 52 OXA-24/40-like producing Acinetobacter spp. isolates from 15 countries. Minimum spanning tree analysis of these isolates based on two different MLST schemes was shown in Fig. 2, which suggested that CC92B/CC2P represented the predominant clone for the OXA-24/40-like producing Acinetobacter spp. isolates from around the world. Carbapenem-resistant Acinetobacter spp. (mainly CRAB) are increasingly recognized as major nosocomial pathogens and considered to be serious threat for human health by US Centers for Disease Control and Prevention and World Health Organization [24, 25]. OXA-23-like carbapenemases were the main reason for the high prevalence and wide dissemination of CRAB from many parts of the world, including China [14, 26, 27]. OXA-24/40-like carbapenemases, which have been reported to be associated with outbreak of nosocomial infection in United States, Spain, Turkey and Ecuador [28–31], accounted for only a small part of CRAB in China [14, 32]. OXA-72, which was first identified in 2004 in an A. baumannii isolate from Thailand, belonged to one of the most important variant of OXA-24/40-like carbapenemases . This study reported firstly a high prevalence and clonal dissemination of OXA-72-producing A. baumannii in a hospital from northeastern China. Carbapenem resistance in A. baumannii was not significantly associated with 14-day mortality in this study (Table 1), which is in accordance with previous studies [33, 34]. However, carbapenem resistance limits the available therapeutic agents, makes the infection difficult to treat, and might be associated with an additional cost of hospitalization . In this study, there was no significant difference over length of hospital stay for carbapenem resistance and susceptible A. baumannii, which might be related with the limited sample size. In vitro antimicrobial susceptibility testing showed that OXA-72-producing A. baumannii and OXA-23-producing A. baumannii exhibited similar multidrug resistance profile, suggesting that they could not be differentiated through detection of antimicrobial phenotype. The risk factor analyses implicated that admitted into ICU and length of ICU stay were the most important risk factors for carriage of OXA-72-producing A. baumannii and OXA-23-producing A. baumannii, as ICU patients are always critical ill and subjected to a lot of risk factors for the acquisition of multidrug resistance organisms (MDROs) . When ICU stay was removed for multivariable analyses, nasogastric intubation and carbapenem use were significantly associated with acquisition of both classes of CRAB, which is in accordance with previous studies [36–38]. The reason for why urinary catheter was significantly associated with carriage of OXA-23-producing A. baumannii, but not OXA-72-producing A. baumannii deserves further investigation. One possible explanation was that the complex conditions and combined therapy of ICU patients compromised the accuracy of multiple logistics analysis, urinary catheter might be just an indicator for critical ill patients who have a high probability of acquiring certain MDROs through contaminated environment or nursing behavior. CC92B/CC2P was by far the largest and most widely distributed A. baumannii clone in the world, especially among OXA-23-producing A. baumannii [27, 39, 40]. Although not so widely disseminated, CC92B/CC2P was still the most important clone in OXA-24/40-producing A. baumannii (Fig. 2). The Rep-PCR and MLST analysis of A. baumannii in this study suggested that OXA-72-producing and OXA-23-producing A. baumannii isolates were genetically related and belonged to the same clone, CC92B/CC2P. It seems that OXA-72-producing A. baumannii has already become endemic in the ICU since 2014, as most of these isolates were continuously cultured without obvious clustering of isolation time. Enhanced infection control measures, such as hand hygiene education programs, environmental cleaning, antimicrobial stewardship, contact precautions , have to be implemented in ICU of this hospital in order to reduce the wide spread of high risk clone, CC92B/CC2P, which represents the most prevalent clone of CRAB in Chinese hospitals. There are some limitations for this study. The first is the inclusion criteria of Acb complex strains, it has been demonstrated that a single patient may have more than one genetic type of Acinetobacter [42, 43]. To avoid the problem of duplicate data, this study adopted a simple inclusion method of allowing only a single isolate per patient. it might limit the ability to monitor the dynamic changes and complex conditions in patients who may be at particular risk of acquiring antibiotic resistant strains through cross-infection or the development of resistance during antibiotic treatment . Another limitation comes from the design of this study, as this is just an one-center study, the epidemiological characterizations of OXA-72 strains in this study might not be generalized to other healthcare settings in China. This study described firstly a high prevalence of OXA-72-producing A. baumannii in ICU of a Chinese hospital, which have circulated in this ICU through clonal dissemination for at least two years. Strict infection control measures must be implemented to contain the ongoing dissemination of OXA carbapenemases-producing A. baumannii in Chinese ICUs. Yong Chen, Yuying Yang and Lin Liu contributed equally to this work. The study was supported by a grant from the National Key Program for Infectious Diseases of China (2018ZX10733402), Beijing Natural Science Foundation (7172157) and the Beijing Nova Program (Z181100006218107). LH, HL, JS and HG conceptualized and designed the study. YY, LL, GQ, XH, ST, JZ, FC were involved in the data collection, generation, and performed laboratory analysis. YC, YY and LL analyzed and interpreted the data, drafted the manuscript. LH and HG revised the manuscript critically for important intellectual content. All authors read and approved the final manuscript. The study was approved by the institutional ethics committees of the Academy of Military Medical Sciences of the Chinese People’s Liberation Army, Beijing, China. Because the study was epidemiological without any interventions and all the data were collected and analyzed anonymously, the requirement for informed consent was waived.